Biscuits and most baked goods are on the Avoid list for a heart healthy diet because they are notoriously high in sodium but, finally, I played around and came up with a low sodium country biscuit recipe that actually tastes like a good flaky homemade biscuit and allows us to indulge in our favorite weekend breakfast, occasionally. For my husband, one of the biggest adjustments he had to make in order to follow his cardiologist’s orders for a strict low sodium diet was giving up sausage and charcuterie. Tragically, that meant banishing his beloved biscuits and sausage gravy as an occasional weekend breakfast treat. Sadly, this meant that all of us were deprived unless we snuck out and ate Sunday brekkie without him, but then again, no one makes sausage gravy like I do, so College Girl and I never did, plus that’s just plain mean! While the biscuits have literally no sodium, thanks to Hain Featherweight Sodium Free, Gluten Free baking powder, make no mistake – sausage does, and this down-home, soul satisfying Southern specialty should be enjoyed only on occasion. For us, this occasion was being on vacation at our lake house in the Ozarks region of Northwest Arkansas. Born in Chicago, my sisters and brother and I spent the greater part of our formative years in Eureka Springs, Arkansas and something always pulled us back there. It’s a surprisingly beautiful area with sweeping vistas and myriad lakes that attract fishermen, water sport enthusiasts, hikers, and campers. Through the years we all would make trips home to see our mother, who recently passed, trying to coordinate with each other so she would have one of her kids visiting every few months, especially after her Alzheimers dementia became so advanced that we were forced to move her into an assisted living facility. Such a tragic disease, but let’s not go there. No better place to be when the temperature and humidity rises in the South than on the lake! These biscuits may not be quite as lofty as biscuits made with real baking powder – its the baking powder that causes baked goods to rise and its also what makes baked goods so high in sodium, but the taste is there and they aren’t heavy like some past attempts using low sodium biscuit mixes and such have been. Since there is no added salt, I included a teaspoon of a salt-free spice blend, such as Mrs. Dash’s Original Table Blend, to avoid a bland biscuit, no one wants that. 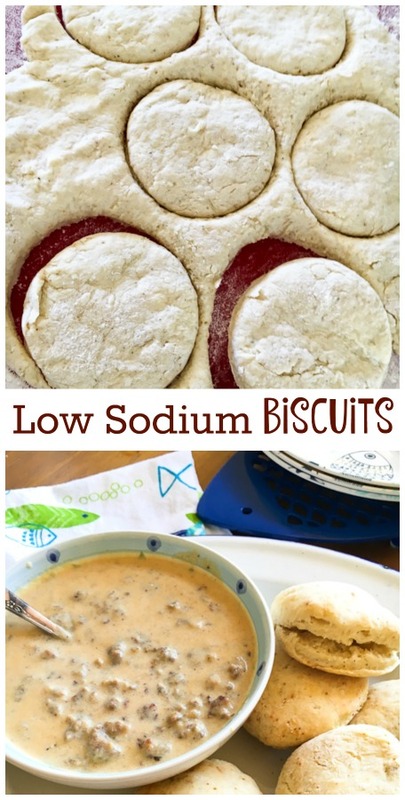 Finally, a low sodium country biscuit recipe that actually tastes like a good flaky homemade biscuit and allows you to occasionally enjoy that Southern favorite - biscuits and gravy! In a large bowl, combine the dry ingredients, stirring to mix well. Cut in the shortening, using two knives or forks or a pastry blender, cutting up the pieces of shortening into the flour until they are pea-sized. Gradually stir in milk and mix until the dough begins to form a ball. Scoop the dough ball onto your floured surface, dust with just enough flour to make the surface less sticky. With floured hands, gently knead the dough being careful not to overwork the dough. * Then, press the dough out into a rough circle about 1 inch thick. Cut out circles with a biscuit or cookie cutter about 2-1/2 to 3 inches in diameter. I used a glass tumbler, like my mom used to. Transfer the biscuit rounds to a greased cookie sheet and bake for 13-15 minutes, or until the tops are lightly browned. * To "cut in" serves the function of distributing the fat particles into the dry ingredients, typically flour, and by coating and lubricating flour granules. This method greatly reduces the ability of the gluten proteins in the flour to create gluten when mixed later with a liquid, such as water or milk. This also results in a flakier product when rolled or formed before baking. The secret to success is that the solid fat must remain cold at all times before baking. If using shortening, use tablespoon size amounts and there is no need to chill it beforehand. Nutrition Analysis below via MyFitnessPal.com. Learn how to make the Sausage Gravy that is undeniably some of the best ever – it’s actually quite easy! I can’t say enough good things about Hain’s Featherweight baking powder – it works wonderfully in cornbread, resulting in a light, fluffy piece of carb heaven. My heart healthy King Cornbread recipe was perfected over the years and is one of my family’s most requested favorites. And well-loved on Pinterest, too 🙂 Check it out – fluffy and light with a nice crumb, medium grind stone ground cornmeal lends a nice chew, and a 1/4 cup of sugar adds just a bit of sweetness. Thanks Priscilla !! What a treat. When I was growing up in rural Arkansas and Texas in the 1940s and 1950s biscuits were made differently. Few people could afford bought sliced bread, we called it “light bread”. A flakey or crumbly biscuit will not hold together with a fried egg, piece of salt pork or sausage inserted to make a sandwich for work or school dinner (now lunch), They melt from the grease. Think McDonald’s sausage and biscuit, melted crumbs. My Grandad had a name for this type of biscuit that cannot be printed here. The difference is the way the shortening, in those days, lard, is added. I followed the link to a “Southern Buttermilk Biscuit” made with a boxed mix. (Insert giggle here.) I guarantee none of you would eat a real buttermilk biscuit. Buttermilk is nothing like the liquified horror sold today as buttermilk. Much of the rural South didn’t have electricity until the 1950s. Yet we had milk and milk products, (and biscuits) much different from today. The nearest analogy would be rural Russia and Mongolia milk products. I grew up on farms and we ate a lot of sausage, but no one made sausage gravy. I first encountered sausage gravy in the late 1970s. I just don’t like it. Thanks for this. Any idea how much sodium in each biscuit? Hubby just diagnosed with CKD and he loves biscuits and gravy. Hi Kay – I posted the nutrition analysis for the biscuits. They have only 21 mg of sodium, which is fantastic! Thanks so much Priscilla. Can’t wait to try them for my hubby. He loves biscuits. 88 year old mom has High patassium level. Are these reciepes for her? Don’t know how to start. Seems everything is high in patassium. Hi Tanya – I have never frozen the dough, so I don’t know for sure, but it is worth a try, if you want to make a double batch.